In 2014-2015, the Asian Farmers Association for Sustainable Rural Development (AFA) implemented a project entitled “Popularizing the VGGT Among Small Scale Farmers Organizations, Relevant National Government and Inter-governmental Organizations” with the support of the International Land Coalition (ILC). The project aimed to (1) deepen the understanding and appreciation of VGGT by farmer leaders and key government officials at national level amidst their current conditions and struggles on land issues; and (2) support and facilitate implementation of land tenure assessment and action plans particularly those concerning large-scale land investment at the country and regional levels. Through this Project, AFA conducted three pilot country studies conducted by AFA member farmer organizations: in Bangladesh, led by Kendrio Krishok Moitree (KKM); in Kyrgyzstan, led by Union of Water User Association Kyrgyzstan (UWUA); and in Cambodia, led by Farmer and Nature Net (FNN) and Farmer and Water Net (FWN). Local and national consultations were done in these three countries, involving 139 participants (with 42 women), with representatives from smallscale producers, non-government organizations, relevant national government agencies and intergovernmental organizations. In these national consultations, a draft policy paper comparing the VGGT provisions with relevant national laws were presented for further validation. A set of key policy recommendations and action points were then set out. AFA also conducted a regional sharing workshop among AFA members and key partners in August 2015 to share and learn from the existing initiatives on popularizing VGGT and to draw some lessons learned and key action points for further promoting the VGGT in the Asian region. The workshop was participated by 42 participants, with 16 women. This issue paper highlights the experience, challenges and opportunities in popularizing VGGT. 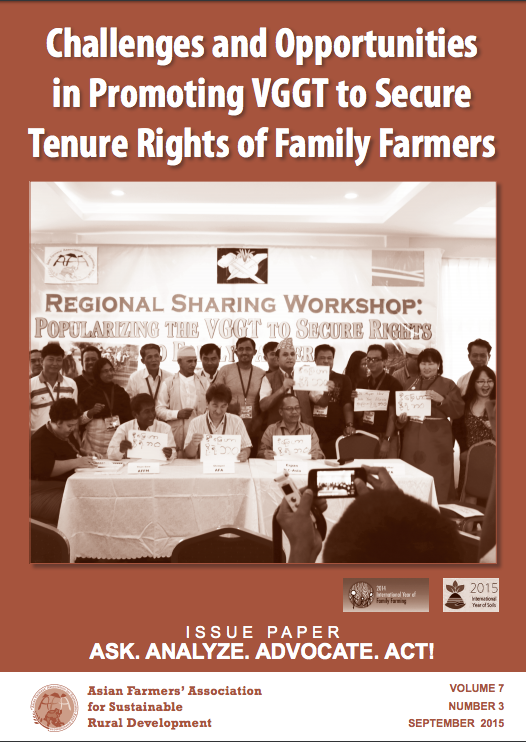 It also puts forward some concrete recommendations on how to adopt VGGT principles and provisions in a country’s legal framework to secure tenure rights for family farmers.